Jeanetta Lyle 'Jean' Menninger was the wife of Dr. Karl A. Menninger and mother of Rosemary. She was founding co-editor of the Bulletin of the Menninger Clinic in 1936 and co-author with Dr. Karl of several books. She and Dr. Karl founded The Villages for neglected and abused children. 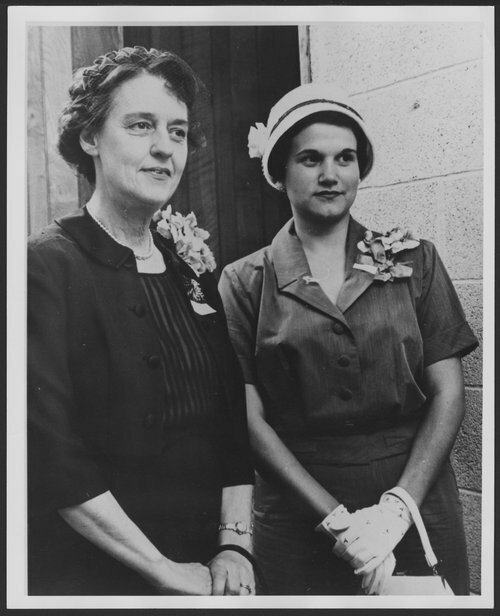 Jeanetta Lyle Menninger - Jean Menninger and Mrs. Patrick Linton, president-elect of Winter Wives Club, named for the wives of the psychiatrists training at the Winter V.A. hospital along with the Menninger Clinic.